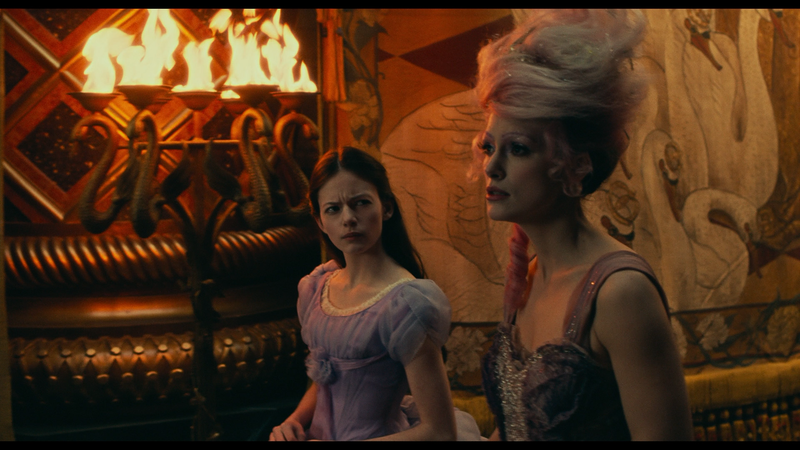 The Nutcracker and the Four Realms is hardly terrible and I’d happily watch this over either of Disney’s Alice in Wonderland live-action films, but considering I hated both of those, that’s faint praise. Buena Vista Home Entertainment provided me with a free copy of the Blu-ray I reviewed in this Blog Post. Plot Synopsis: Young Clara (MACKENZIE FOY) needs a magical, one-of-a-kind key to unlock a box that contains a priceless gift. A golden thread leads her to the coveted key, but it soon disappears into a strange and mysterious parallel world. In that world, she meets a soldier named Phillip (JAYDEN FOWORA-KNIGHT), a group of mice and the regents — including Sugar Plum (KEIRA KNIGHTLEY) — who preside over three realms. Clara and Phillip must now enter a fourth realm to retrieve the key and restore harmony to the unstable land. 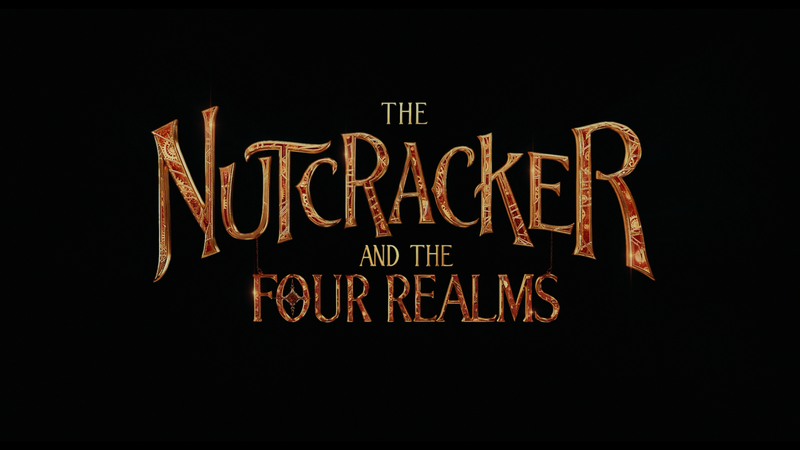 Review: Disney brings us yet another re-imagining of a classic along the lines of Alice in Wonderland and its uninspiring sequel, Into the Looking Glass, with The Nutcracker and the Four Realms, a lackluster adaptation of the Nutcracker Ballet and The Nutcracker and the Mouse King short story. This is a rich visual extravaganza that shockingly lacked very much imagination. The set and production and costumes designs seemed to be leftovers from other Disney family-fantasies. Beyond that, really doesn’t feature very much in the way of charisma from the ensemble cast. 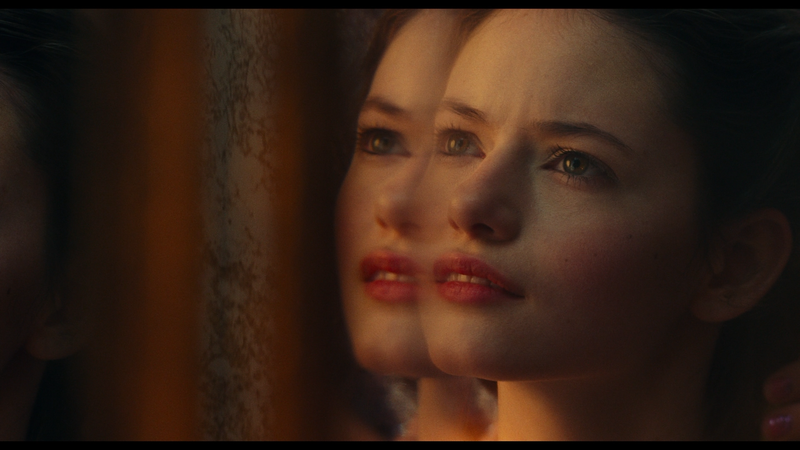 Mackenzie Foy reminded me a lot of Mia Wasikowska from Alice in Wonderland, in that she’s not a terrible actress but not the right personality to be a lead actress either. Foy has a couple veterans surrounding her from a fairly unrecognizable Keira Knightly (giving me nightmares of Anne Hathaway from AIW) and Helen Mirren who has a small role and doesn’t make much of a mark. The film has the unusual precedent of having two credited directors with the approval of the DGA. We’ll never know the full story as Disney, unlike Warner, tend to keep their drama in-house, but veteran director Lasse Hallström handled the production while Joe Johnston came in to do some extensive reshoots (36 days worth apparently) when Hallström was unavailable due to “scheduling conflicts”. 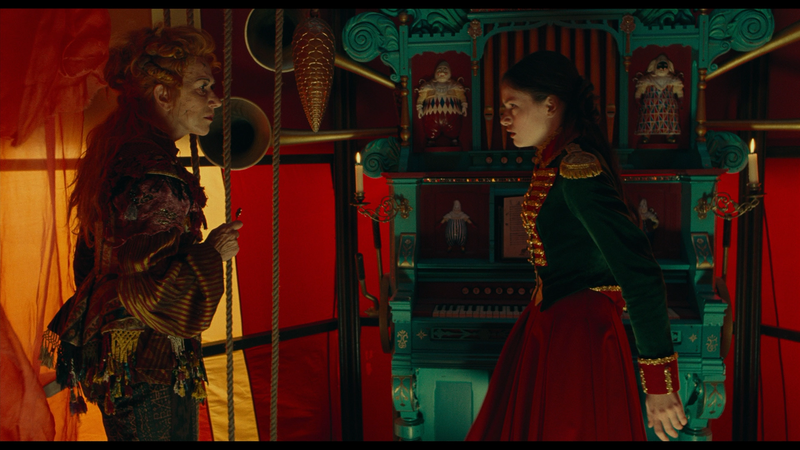 Whatever happened, even though this is certainly not the Frankenstein of a film that Justice League was, The Nutcracker and the Four Realms certainly did lack a consistent vision and worse yet, not a whole lot of emotion either. This release comes with a glossy and embossed slip cover. Inside is a code for the Digital copy. Features aren’t terribly extensive with On Pointe: A Conversation with Misty Copeland (4:36; HD) where the traditional ballerina discusses her involvement with the movie; Unwrapping The Nutcracker and the Four Realms (7:08; HD) is a short behind the scenes featurette with promotional interviews with the cast and crew; some Deleted Scenes (4:05; HD) and lastly two music videos, “Fall on Me” (4:23; HD) by Andrea Bocelli featuring Matteo Bocelli and “The Nutcracker Suite” (4:06; HD) by Lang Lang. 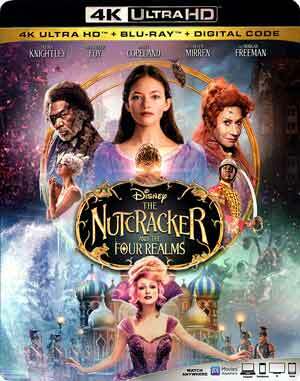 One would think a movie like Nutcracker and the Four Realms would look fantastic on 4K UHD and while indeed it does look nice, I can’t quite say it was brilliant. When comparing with the Blu-ray disc, I didn’t find it to be a significant difference. It might’ve been a bit sharper sure but even something like the colors appeared more or less similar, that is the colors were at least bright. That said, both the 2160p and 1080p transfers were very nice looking and will come across the screen quite well. The 4K UHD comes with a Dolby Atmos track while the Blu-ray, and this is a pet peeve of mine, a DTS-HD Master Audio 7.1 track. Why these studios don’t just provide the same audio codec on both formats is beyond me. In any case, both of the tracks are effective outputting crystal clear dialogue via the center channel and there was some good depth for the variety of fantasy-“action” scenes making great usage of the available front and rear speakers. Overall, The Nutcracker and the Four Realms is hardly terrible and I’d happily watch this over either of Disney’s Alice in Wonderland live-action films, but considering I hated both of those, that’s faint praise. Even so, I guess this is perfectly safe for families as there is a nice message at its core and the visuals at least were nice to look at, even if some of it seemed recycled. The screen captures came from the Blu-ray copy and are here to add visuals to the review and do not represent the 4K video.